How to paint like me! I’m frequently asked if I teach classes. People come into my cheery studio full of shiny, colourful paintings and feel a creative spark. Although I have taught children’s classes, I’ve never taught adults and I don’t think I’d been good. I’m from the “Do 100 more paintings and see if that helps” school of art. So this tutorial is the closest I’ll ever come to teaching. I was contacted by the lovely—and very patient—Rebecca Zak about getting some Art Resin in exchange for posting a project. Since I already use Art Resin, I quickly agreed—then took months to post this tutorial. Sorry, Rebecca! I’m a huge proponent of mistakes in art. While I will show you the steps I took, the best art occur when you mess up or things don’t turn out as planned. Feel free to do things differently or make substitutions. Art is improvisational—at least that’s what I tell myself when I screw up yet again. Additional supplies: rubbing alcohol, drinking straw, protective gloves, stir sticks, blow torch, mask, plastic containers. Take a wood panel and tape the sides to protect them. Then trowel on gesso as smoothly as possible. I let it dry, sand the surface, and then reapply gesso. And I repeat about six times to achieve a beautiful soft surface. I’m sure that some of you are ready to bail already. Six times, Mary Anne? That’s going to take a week! Do whatever works for you, two coats may be enough. I like drawing on a glossy surface so this is what I do. My rough outline looks more like an electrocuted worm. ﻿I was originally thinking about a Valentines project (which shows how long I’ve been working on this!) so I chose lace as my motif. I took a piece of lace and painstakingly drew all the twisty thready details in black ink. And then, guess what happened? I accidentally smeared the ink over my delicate drawing! Ack. But you know what? That mistake animated the drawing. It brought contrast and form to my rendering. So I deliberately smeared the next one too. That’s exactly what I mean about the best art coming from errors! The finished drawing complete with accidental inkblots. Step Three: Add alcohol ink. Okay, once your black ink drawing has dried, it’s time to add some alcohol ink. In this case, I’m using a limited palette of pink and yellow, so I chose pink ink. I sprayed rubbing alcohol on the surface of the painting and then added drops of ink. I used a straw to blow the ink around the surface. What you’re trying to achieve is a very loose, fluid form. Keep in mind that you want to leave some white space on your painting. To achieve colour depth, let the ink dry and then apply another layer. This is a good place to fool around and have some fun. Loose, organic ink shapes AKA mistakes. Step Four: Apply coloured resin. Once the ink has dried completely, it’s resin fun time! Rest the panel on a container so excess resin can drip off the sides. Use a level to make sure your panel is even, otherwise gravity will pull the resin to one side. Since I use different types of resin, I wear a respirator and gloves each time I use resin. A well-ventilated room is important too. For further resin tips, check out the Art Resin website. Mix up your resin (the quantity depends on the size of your panel, but estimate about half of what you would need to cover the whole panel.) Mix the resin well, and then add yellow colourant. Better product placement than a K-drama! To colour my resin. I use a transparent tint which I get from my industrial resin supplier Fibertek. Unfortunately, it’s not yet available for online purchase. An alternative is a very small quantity of Art Resin Neon Yellow resin dye. Don’t use too much or it becomes opaque. Add a few drops at a time and mix well. Another suggestion is a very small amount of acrylic paint. I tried alcohol ink, but the colour is too pale. 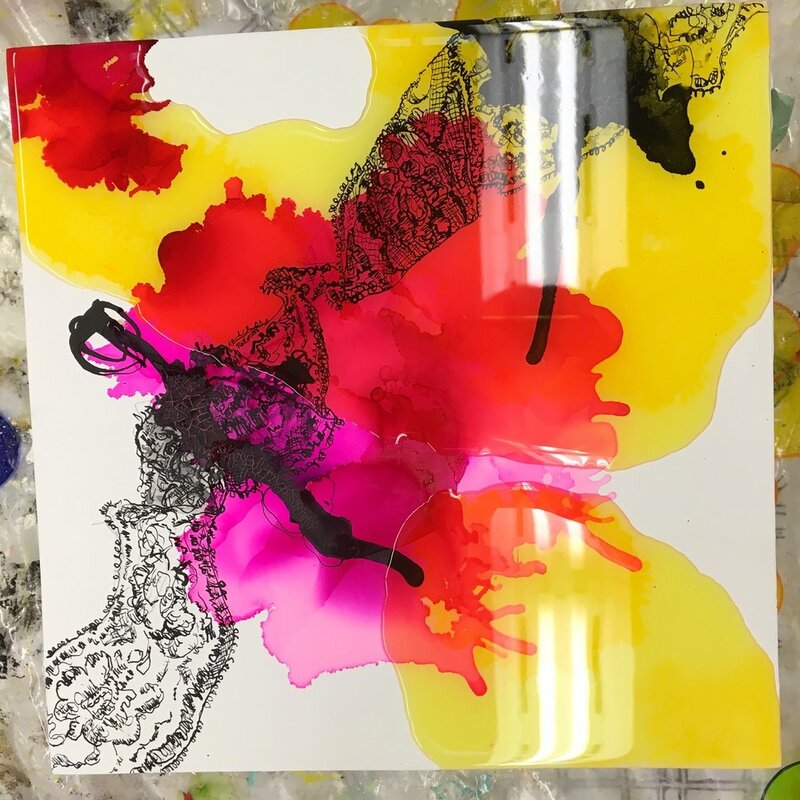 Mix the colour in well, and then pour resin on your panel in a loose composition. Go slowly because it’s harder to remove than add. (Although, you can scrape off excess resin with a spatula. I know, because I’ve made ever possible mistake with resin.) What you’re aiming to see at the end is some original pink, some yellow, and best of all a gorgeous orange where they overlap. One caution, Art Resin is very liquid, so it continues to spread while it sets. Many times, I’ve left resin shaped like a donut only to find the donut hole gone when it’s set. Donut becomes cookie! Once you’re happy with your composition, use a blow torch or heat gun to get rid of the bubbles in the resin. This is also the time to closely examine your resin surface for errant specks or fibres which you can easily remove. I use an old X-ACTO knife. Sorry this photo is crooked. I must have been high on resin fumes. After allowing your resin to set, you have to decide if you’re happy with the composition. Since my personal art philosophy is More is Better, I thought this painting needed more layers. This time, I mixed up pink transparent resin and applied it on top of the dried yellow layer. Juicy, candy layers! Working with resin always makes me hungry. Step Five: Final resin coat. Once I’m happy with coloured resin layers and they have set, I add a top coat of clear resin. This step is optional, because some prefer the look of multilayered paintings. However I have found that white gesso marks easily, so for smaller works like this that can get handled, I put a clear coat on top. Of course, coming from the More is More school of art, I would never make only one painting at a time. In this case, I made six paintings in the lace theme. If you’re going to all the work of mixing resin, it only makes sense to resin more than one work at a time. I used yellow alcohol ink on half, and pink on the other half. You can see that they’re elevated to allow for resin drips. As well as drawings, I used relief prints of lacy objects and a silver doily for background images. I used pink ink and yellow ink for the second layer, and then the opposite colour for the resin layer. I also added glitter to one. For a closer look, you can see them on my website, in my shop. There’s a magnifying feature so you can see all the details. The lace gang hanging out. This project isn’t too complicated, but it requires you to loosen up and develop a critical eye. Does the painting look good now or does it need more? (My answer: more.) Think about negative spaces, those places you’re leaving white. Enjoy the new colours created when you layer one transparent colour over another. Most of all, relax and make mistakes because that’s when the best art happens! We all know the fantasy. When an artist travels, she makes delicate watercolour and ink sketches of the charming garden of her B & B. Or sketches her croissant and jam breakfast complete with hovering hummingbird. Or line drawings of adorable scamps kicking a ball around an ancient piazza. All neatly bound up in a black Moleskine. The reality for me, having returned from a three-month trip to Europe, is quite different. I am strictly a studio artist. When I paint, I need the ALL the art supplies around me, and I make a big mess. So if I make art on the road, my Airbnb reviews will be in the toilet once I redecorate my host's apartment with random blotches of paint. But I have found other ways to stay create while I travel, and I'd like to share them with you. Obviously, if you can't be in your own studio, be in someone else's. I visited Cezanne's dusty and well-preserved hilltop studio in Aix. My best studio experience was when I visited Cheryl Fortier at the artist residency compound she runs in Auvillar, France. Cheryl's recent work was an intriguing departure for her, a huge, elaborate drawing in marker and pencil. And while we stayed there, I got my own studio too! I drew and coloured in a room filled with sunlight and good art vibes. Since Cheryl and I shared a studio in Vancouver, it felt very natural to be working next-door to each other. Ahh Europe. So many amazing art shows! So many free museums. I’ll blog about the best art later, but as a Canadian living in a city with one tiny public art museum with sky high prices, I’m jealous. Seeing an amazing art show is always energizing, so I cram all that inspiration into my photos and travel journals. The most inspiring show for me was Cy Twombly at the Pompidou in Paris. His loose, languid use of line and paint was gorgeous and sensuous. So, I took photos, bought a catalogue, and made notes of techniques to try once I got back to my studio. As a visually-inspired painter, photos are the best way to for me to remember all that great creative energy. Collage is one art practice that lends itself well to travel. You’re already picking up foreign ephemera like tickets, brochures, and postcards. Half-torn posters already look like my art anyway, so I rip those off the wall and stuff them in my purse. And if you happen to be in Bologna during April, they salute the new graduates with singing and glitter confetti! Yes, glitter confetti in the shape of flowers! I gathered it up from the gutter as my husband pretended not to know me. When I write travel journals, I add illustrations in the form of admission tickets or brochures anyway, so collage only takes this one step further. All you need are scissors and a glue stick or washi tape. A mailing tube is good for storing art purchases and your own creations. When I was in my twenties, I haunted clothing stores looking for the best deals on the cutest outfits. But now, art supplies stores turn my crank. There’s nothing I like better then finding unusual and new-to-me materials. This trip I hit up the Sennelier Art Store in Paris. I’ve used Sennelier chalk pastels for years, but this place is more than just pastels. In fact, the location I went to is the oldest art store in Paris. Ghosts of Cezanne and Picasso swirled around me as I poked through the worn wooden display cases. I went upstairs where I found a weird paintbrush with four separate ferrules and a box of neon watercolour paints from Japan. Despite—or possibly because of—the dismissive explanations of the snotty saleswoman, I handed over many euros and took home these items that I have yet to use. But they’re inspiring anyway, because they remind me of my time in Paris. When I travel, I love to buy art supplies. They create packing problems, but in my studio right now, I have neon pink paint from Arhus, Denmark; drawing pens from Tokyo, and pink gouache from Venice. Pink is my weakness. One of the many retrospectives I saw was David Hockney at the Tate in London. And he was clearly addicted to art, painting everywhere he went—even hotel rooms! While the large scale paintings were impressive, one interesting room was filled with iPads. Each iPad showed a painting that he had done with the app Brushes. The paintings were live videos of his process as he added strokes, changed colours, and erased sections. It was fascinating to watch. Then it occurred to me that I could do the same thing: download the Brushes app on my phone and have an ever-present sketchbook. Brushes Redux is the app available now and it’s free. I used the very next day to sketch a statue in the British Museum, and there’s a bit of a learning curve to create really good work (I’m not there yet) but it’s lots of fun. There you go, lots of ways to stay creative on the road—without making a mess! If you want to see some of my visual inspirations from Europe, do check out my Instagram feed . This marks the return of my blog after a two year hiatus. And I will be writing more about my adventures in Europe, including shows by Cy Twombly and Damien Hirst. I have incorporated this blog into my website, but unfortunately the name changed from Ten Feet of Crazy Energy to the more prosaic Blog. I would like to thank the many (well, three anyway) people who have been asking me to blog again. I'm back!